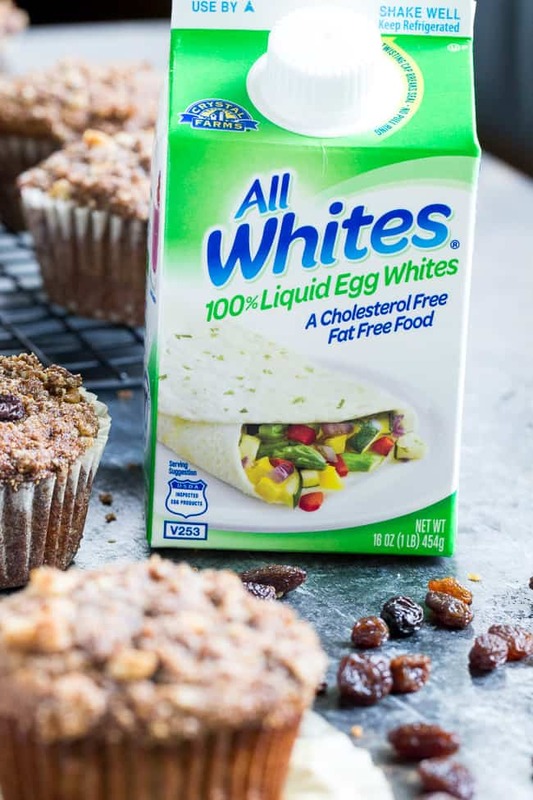 This is a sponsored conversation written by me on behalf of AllWhites® 100% Liquid Egg Whites. The opinions and text are all mine. 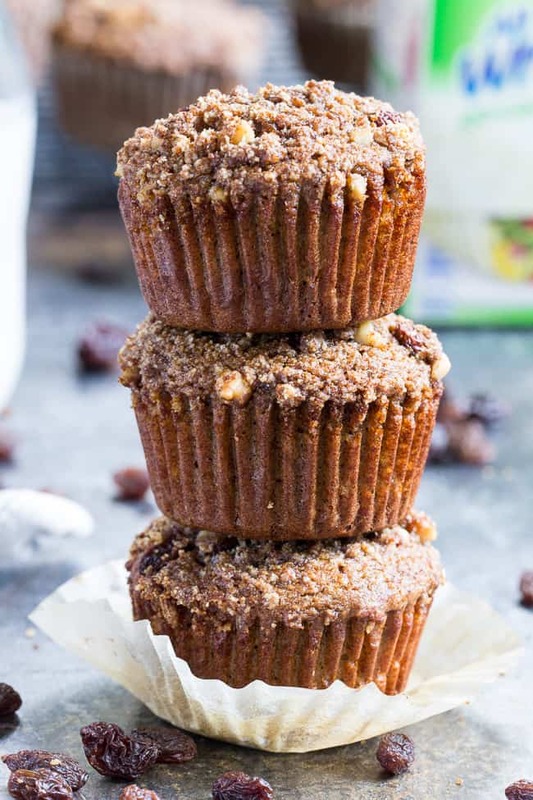 These paleo muffins are loaded with cinnamon flavor, studded with juicy raisins and topped with the perfect cinnamon crumble! Make them with your kids for a fun breakfast treat or snack – they’re grain free, dairy free, refined sugar free and delicious! It’s been muffin mania over at my house recently, and no one’s complaining! 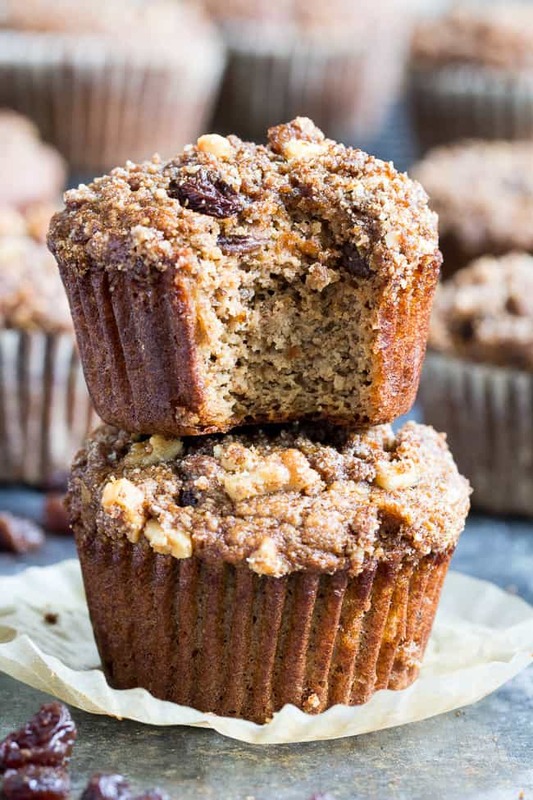 There are lots of reasons to love muffins, and it’s even better when we switch it up a bit from the typical banana chocolate chip or blueberry muffins. 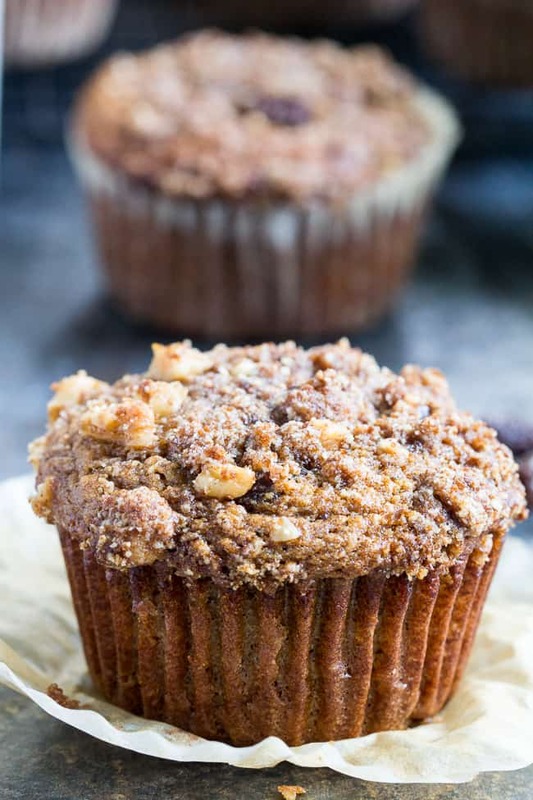 Soft and tender muffins with tons of flavor and an addicting crumb topping? Check! Oh, and they happen to be made of good for you ingredients, too. BIG WIN! For my kids, and for me! The idea for these muffins came from both my readers and my kids. I recently received so much positive feedback on my hearty paleo cinnamon raisin bread, which also happened to be one of my kids’ favorites, too. I often ask them for recipe advice (it helps, A LOT!) and when I mentioned making a muffin version of the cinnamon raisin bread, they were completely on board. When I turned the bread into muffins though, I made a few changes that really made them shine! First I decided the muffins HAD to have a crumb topping. Okay fine, the kids made that decicion for me. 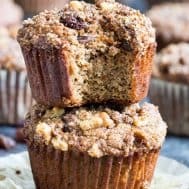 I used a topping similar to my blueberry muffins, but included finely chopped pecans (you can use walnuts too) for extra nuttiness and crunch. It just felt RIGHT with all that warm cinnamon flavor and juicy raisins. This is a great afterschool snack that the kids can help make on Sunday, and then enjoy after school all week! The second change I made was using AllWhites 100% Liquid Egg Whites in place of whole eggs. While I typically use whole eggs in my quick bread and muffin recipes, I thought it would be a great idea to experiment with incorporating liquid eggwhites into one of my favorite snack recipes. Pasteurized for safety. You can enjoy AllWhites uncooked, in salad dressing recipes, shakes, smoothies, desserts like tiramisu and more, without concern for food borne illness. I hope you’re ready for more deliciously healthy news, too! AllWhites egg whites has an incredible giveaway for my readers – the Curious Chef 27 piece foundation set – https://www.amazon.com/dp/B002OSMIA6?psc=1. To enter the giveaway, all you have to do is leave a comment below the post by answering the question – what’s your kids’ favorite afterschool snack? 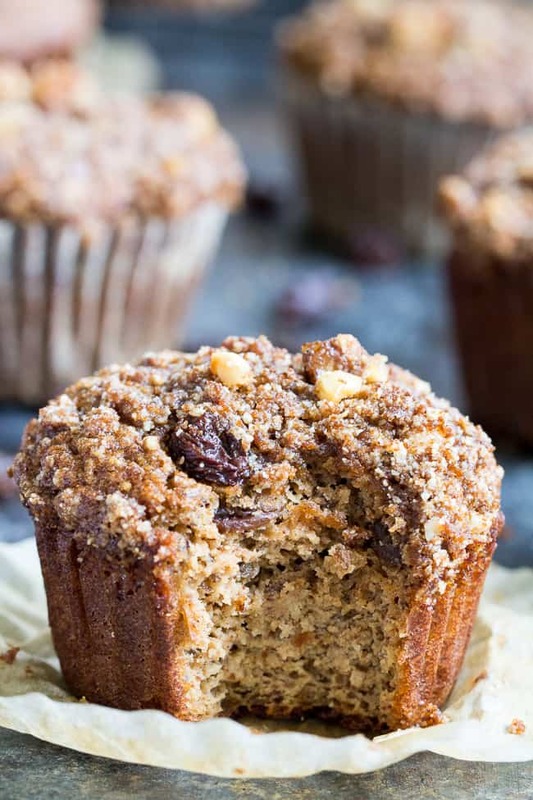 Then go preheat your oven so you can bake these delicious muffins! I know you guys will love them. 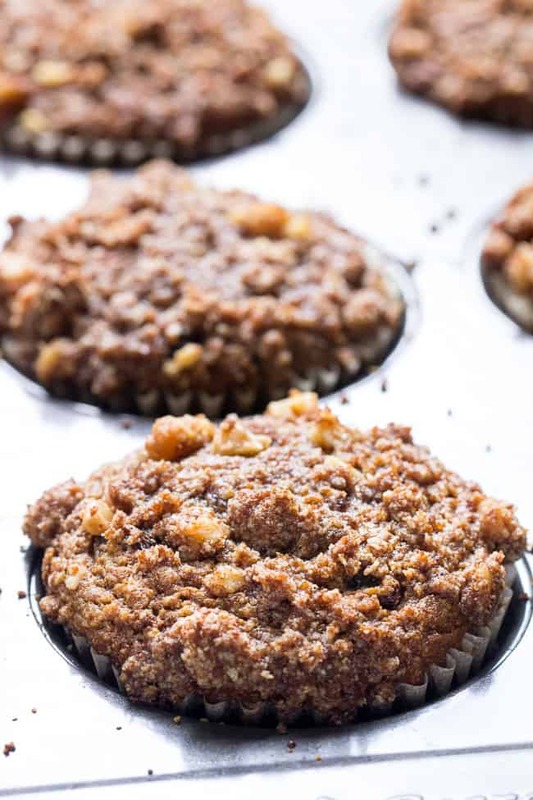 These paleo muffins are loaded with cinnamon flavor, studded with juicy raisins and topped with the perfect cinnamon crumble! Make them with your kids for a fun breakfast treat or snack - they're grain free, dairy free, refined sugar free and delicious! Preheat your oven to 375 degrees F and line a muffin pan with parchment liners. Make the crumb topping frist: combine all ingredients in a medium bowl using a pastry blender or fork to creat a thick crumbly mixture. Chill while preparing muffin batter. Combine the almond flour, flaxseed, cinnamon, nutmeg, baking soda and salt in a medium bowl, set aside. In a separate large bowl, whisk together the egg whites, applesauce, almond butter, coconut sugar, and vanilla until smooth. Gently stir in the dry ingredients, careful not to overmix, then fold in the raisins. Spoon the batter evenly into the 12 cup muffin pan, filling each 3/4 of the way. Sprinkle the top with a layer of the crumb topping, using all of it. Bake in the preheated oven for 15-20 minutes or until a toothpick inserted in the center of one comes out clean. Makes 12 muffins. Enjoy! Remember to enter the AllWhites egg whites giveaway and win the Curious Chef 27 piece foundation set – https://www.amazon.com/dp/B002OSMIA6?psc=1. To enter the giveaway, all you have to do is leave a comment below the post by answering the question – what’s your kids’ favorite afterschool snack? 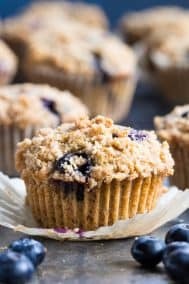 My boys love homemade muffins or bars for their after school snack. If I don’t have anything made up my fall back is a Larabar. This looks like the ideal snack for the kids when they come home from school. I know I will enjoy them too! I use 1/4 cup of egg white for each egg. Use 1 Tablespoon of powder & 3 Tablespoons of water for each 1/4 cup. I would say their favorite snack is peanut butter and jelly energy bites. They also like chocolate and peanut butter energy bites. 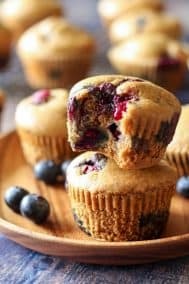 We love muffins for a snack or breakfast. I can’t wait to try this new recipe! Favorite after school snacks: frozen grapes and yogurt granola ice pops!!! Those look so good! My kids favorite snack is probably olives and pickles ? Favorite afterschool snack is cinnamon toast. These sound really delicious I’m going to give these a try thanks! Our kids generally eat whatever is on hand. If there are apples in the fridge, they eat those. If there are snack cakes in the cupboard, they eat that. I thing as long as it is sweet, they are happy to have it. Cheese w/ apple slices are quick and pleasing. My boys will eat anything they can get their hands on after school but their favorites are apples with peanut butter and rice cakes with nutella. 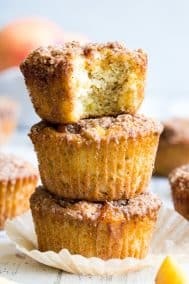 Definitely trying these muffins soon! What is the portion for the creamy almond butter unsalted? 2/3 tbsp or tsp? I found these on All White’s website while I was looking for another recipe and I’m glad I found these instead! They were amazing! I rarely eat any baked goods I make after a few days (I have a habit of getting sick of them!) but these were definitely the exception. I popped them in the fridge and had one for breakfast or lunch every day until they were gone. Thanks for sharing such a great recipe! Also, don’t skip the raisins – they make them even more delicious! Yuuummmm!! these look absolutely amazing. Cinnamon raison is definitely a favorite in our house! I love muffins for busy work weeks, helps get us out the door faster if breakfast is already prepped. How many eggs should I use if I’m not using the liquid Allwhites? Just made these tonight and they’re delicious! The crumble topping is awesome and I even after I cut it back to 2tbs coconut sugar with a little stevia. Perfect for a cinnamon craving – I’m trying the cinnamon rolls next though! Can I substitute applesauce for anything, like egg? I just won’t use up the applesauce if I buy it.